New York - The Photography Show will be held Thursday, April 5, through Sunday, April 8, 2018, at Pier 94 in New York City. The 38th edition of the Show will feature 96 of the world’s leading fine art photography galleries, over 30 book sellers, 15 AIPAD talks, three special exhibitions, one screening room, and more. Presented by AIPAD (Association of International Photography Art Dealers), the fair is the longest-running and foremost exhibition dedicated to the photographic medium. A vernissage will be held on Wednesday, April 4. Presenting a range of museum-quality work including contemporary, modern, and 19th-century photographs, as well as photo-based art, video, and new media, The Photography Show will feature galleries from more than 14 countries and 49 cities from across the U.S. and around the world, including Europe, the U.K., Asia, Canada, and South America. Twelve new galleries are exhibiting for the first time at AIPAD this year: 6x7 Gallery Warsaw; galerie SIT DOWN, Paris; In The Gallery, Copenhagen; Jean-Kenta Gauthier, Paris; MEM, Tokyo; Paul Nicklen Gallery, New York; Sears-Peyton Gallery, New York; Senior & Shopmaker Gallery, New York; The Ansel Adams Gallery, Yosemite National Park, CA; Three Shadows +3 Gallery, Beijing; Todd Webb Archive, Portland, ME; and Toluca Fine Art, Paris. A complete listing of exhibitors is available at AIPADshow.com/Exhibitors. Artists employ objects in multiple ways - as a subject, an idea, and an extension of an artwork itself. In Serial Structures: The Object in Performance at JHB Gallery, New York, seven artists look at objects as mundane as a plastic water bottle and as exalted as a mirror reflecting the forest of Fontainebleau. Performance/Politics will present depictions of both villains and heroes by more than 35 photographers, from Phyllis Galembo’s 2016 image Trump Mask, Mexico to Dan Weiner’s 1956 portrait Martin Luther King Jr., Bus Boycott, Montgomery, Alabama. The exhibition will be on view at Steven Kasher Gallery, New York. A solo exhibition, W. Eugene Smith at 100, will be exhibited at Etherton Gallery, Tucson. The work is from the archive of Takeshi Ishikawa, who was Smith’s assistant for three years during the photographer’s time in Minamata, Japan. Smith covered the environmental disaster caused by the Chisso Corporation, which from 1932 to 1968 had dumped mercury into the water. Some of the images of Smith at work in Minamata have never been shown outside Japan. Celebrating the arrival of spring, A Flower Show—with photography by Tony Mendoza, Mike Smith, and Lucinda Devlin, among others—will be presented by Lee Marks Fine Art, Shelbyville, IN. Artist Binh Danh fled Vietnam and arrived in the U.S. with his family when he was a child. Danh’s work calls attention to Vietnam’s history and the many victims of the Khmer Rouge regime. Using his unique method for creating chlorophyll print photograms on tree leaves, Dahn then reproduces them in daguerreotype form to memorialize the faces of the Cambodian genocide. A solo exhibition of his recent work, Binh Danh: The Ghosts of Khmer: Light and Memory, will be on view at Lisa Sette Gallery, Phoenix. MEM, Tokyo, will offer a solo exhibition of the work of Gen Otsuka, a renowned 20th century Japanese photographer who worked in postwar photojournalism in Japan and played a role in the development of modern Japanese photography. Dutch artist and cultural anthropologist Witho Worms links the altered landscape to his finished prints. He photographs the debris left over from coal mining and then grinds the actual coal from the site he photographed into a fine pigment that is used in his photographic process. His work will be on view at L. Parker Stephenson Photographs, New York, as part of a coal-related theme, depicting man’s troubled relationship to the environment. Hans P. Kraus Jr. Inc., New York, offers a walk through the old-growth forests of the 19th century. Into the Woods will include photographs by William Henry Fox Talbot, Gustave Le Gray, and J. B. Greene. In the late 1970s, Lynn Gilbert began photographing the most prominent women in the U.S. and in the process created a time capsule of the American feminist landscape. Her iconic portraits include Julia Child, Ruth Bader Ginsburg, Billie Jean King, Louise Nevelson, Gloria Steinem, Susan Sontag, and Barbara Walters and will be on view at Throckmorton Fine Art, New York. Gilbert’s work is in the permanent collection of the Smithsonian National Portrait Gallery in Washington, D.C.
Sally Mann’s portrait Virginia, from 2004, will be exhibited at Edwynn Houk Gallery, New York. Sally Mann: A Thousand Crossings is on view at the National Gallery in Washington, D.C., through May 28. 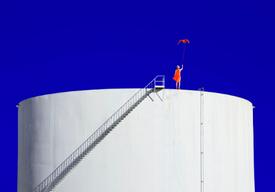 Ethiopian artist Aida Muluneh’s recent vibrant photographs express African women’s issues of gender, identity, and the colonial experience at Jenkins Johnson Gallery, San Francisco. Two celebrated portraits by Yousuf Karsh—of Winston Churchill and of Ernest Hemingway—will be on view at Contemporary Works/Vintage Works, Chalfont, PA. Another pair of portraits, from the mid-1950s by Bernice Kolko—Diego Rivera painting and Frida Kahlo in bed—will be on view at Charles Isaacs Photographs, New York. When the Chinese artist couple Rong Ron & inri were told they had to leave their Beijing apartment to make way for a new development, they held a funeral for their home and used it as a backdrop for their work. Their self-portraits in their soon-to-be-demolished home can be seen at Three Shadows + 3Gallery, Beijing. William Wegman’s recent photographs pair his best-known models, his Weimaraner dogs, with mid-century modern furniture and will be exhibited at Senior & Shopmaker Gallery, New York. His work is also on view in Before/On/After: William Wegman and California Conceptualism at The Metropolitan Museum of Art, New York, through July 15, 2018. Howard Greenberg Gallery, New York, as well as work by Robert Frank, Dorothea Lange, Ray Metzker, Joel Meyerowitz, and William Klein. Galerie Catherine et André Hug, Paris, will show Reine Paradis’s narrative photographs in which she is the central figure in surreal color-filled landscapes. Richard Moore Photographs, Oakland, CA, will offer a collection of silver prints made by 11 photographers working for the Farm Security Administration from 1935 to 1942, including rarely seen work by Dorothea Lange, Walker Evans, and Ben Shahn. In addition, a rare 1932 print by Ansel Adams will be included in a selection of photography by San Francisco Bay Area members of the Group f/64, who sought to promote a new modernist aesthetic. Todd Webb was known for his humanistic mid-20th-century images of New York, Paris, and Georgia O’Keeffe and the American West. A number of his lesser-known photographs, including those from Africa, will be on public view for the first time. His work was seen in a 2017 solo exhibition at the Museum of the City of New York and will be presented at AIPAD by the Todd Webb Archive, Portland, ME. Scheinbaum & Russek Ltd, Santa Fe, will exhibit work from Alfred Stieglitz’s Equivalents series made between 1925 and 1934. Stieglitz was among the first to produce completely abstract photographic works of art. He believed his studies of clouds could express pure emotion, paralleling how the artist was feeling when the shutter was snapped. San Francisco-based photographer Chris McCaw has created an innovative photographic process whereby he exposes vintage photo paper to sunlight over long time frames, resulting in images that are literally seared by the sun. His work will be on view at Candela, Richmond, VA. In 2016, photojournalist Ryan Vizzions went to North Dakota to cover the Dakota Access pipeline protests at Standing Rock. Amplifying the voices of the indigenous people, his work has drawn major attention to the issue and has been published in many media outlets. It will be on view at Monroe Gallery of Photography, Santa Fe. Rolf Art Gallery, Buenos Aires, will show work by Adriana Lestido, one of Argentina’s most renowned photographers, known for documenting women in prison in the early 1990s. The women were allowed to keep their babies with them there, but only until they were two years old. Lestido photographed the women’s arrivals at the facility, their daily life in the cells, and the dramatic separations from the children when they were too old to remain. The series, Imprisoned Women, developed into a book, which was dedicated to Lestido’s father, who had been imprisoned during the photographer’s childhood. Daniel Beltrá’s passion for conservation is evident in his striking large-scale photographs of landscapes shot from airplanes, which offer the viewer both the beauty and destruction he witnessed. His work, which has taken him to all seven continents, can be seen at Catherine Edelman Gallery, Chicago. American photographer Robert McCabe’s photographs of Greece in the 1950s will be on view at galerie SIT DOWN, Paris. McCabe captured Greek rustic life, traditions, and archaeological ruins. Murray Fredericks has made more than 20 journeys to Kati Thanda-Lake Eyre in South Australia to capture the vast and boundless landscape. His work received its U.S. debut at Robert Mann Gallery, New York, this year and will be exhibited at AIPAD for the first time. After entering the field only five years ago, self-taught Dutch photographer Bastiann Woudt has experienced a meteoric rise within the world of photography, with the publication of several books and with his work on view throughout Europe. His portraits and landscapes from his 2017 trip to Mukono in Uganda will be on view at Jackson Fine Art, Atlanta. Yancey Richardson Gallery, New York, will exhibit artists Mickalene Thomas, Paul Mpagi Sepuya, Zanele Muholi, Andrew Moore, and Victoria Sambunaris. Bruce Wrighton’s Saint George and the Dragon series, on view for the first time since 1988 at Laurence Miller Gallery, New York, explores icons and images found in churches and barrooms in the Binghampton, NY, area. IBASHO, Belgium, will show contemporary and modern work by Japanese photographers including Asako Narahashi, Yoshinori Mizutani, Hiroshi Hamaya, and Eikoh Hose. 6x7 Gallery Warsaw, is bringing the work of two Polish artists who are well-known in Europe, Tomasz Wysocki and Pawel Żak. More than a dozen talks will feature prominent curators, collectors, artists, and journalists including Susan Meiselas, Alicia Garza, Sheila Pree Bright, Teju Cole, Sarah Meister, Tina Barney, LaToya Ruby Frazier, Adam Weinberg, Edward Burtynsky, Keith Davis, and Zackary Drucker, among many others. For the first time the Show will present Photography Talking Back, a series of talks with photographers who are using their work to address issues such as immigration, racism, climate change, and gender inequality. A complete schedule of the AIPAD Talks is available at AIPADshow.com/Talks. The Photography Show will present three special exhibitions. A Time for Reflection, curated by Sir Elton John, will include thematic work selected from AIPAD member galleries. Work on view will be available for purchase, and a portion of sales will benefit The Sir Elton John Charitable Trust. Forever Young: Selections from the Joe Baio Collection of Photography, focusing on childhood and adolescence, will be exhibited publicly for the first time. All Power: Visual Legacies of the Black Panther Party, curated by Michelle Dunn Marsh, Executive Director and Curator at the Photographic Center Northwest, showcases contemporary black artists who have been informed or influenced by the Black Panther movement. More information on the Special Exhibitions at The Photography Show is available at AIPADshow.com/Exhibitors/Special-Exhibitions. The second edition of the AIPAD Screening Room will present documentaries on photographers curated by award-winning filmmaker Mary Engel, Director, Orkin/Engel Film & Photo Archive, including films on Yousuf Karsh, Ruth Orkin, Gordon Parks, and W. Eugene Smith. A complete list of films and screening times is located at AIPADshow.com/Programs. Celebrating the contribution of photography books to the evolving story of the medium of photography, Aperture will present daily in-person talks with photographers, writers, curators, and publishers. The schedule of PhotoBook Spotlight talks is available at AIPADshow.com/Programs. The AIPAD Award honors visionaries who have contributed to the field of photography, including artists, curators, and publishers. This year’s recipient of the second annual award is Keith F. Davis, Senior Curator of Photography, The Nelson-Atkins Museum of Art, Kansas City, MO. The award will be presented during the vernissage on Wednesday, April 4 at 5:30 p.m.